This is a guest post by Gary Corbett. What do you do if you find yourself constantly dreaming about your next self-contained cycling tour, your day to day job is to write about cycle touring and you have a wife who is just itching to join you on a long distance cycle tour? You go cycle touring, of course! This is a quiz. 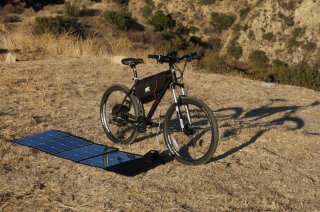 What’s the biggest constraint for an e-bike? The answer is its battery. Clearly if you’re off for a long day’s ride you can’t count on finding a convenient wall outlet to use your charger. Besides, who wants to carry that thing anyway? But what if you could harness solar power, and do your recharging in a reasonable amount of time so you can get back on the road? Well, that’s the solution that Hi-Power Cycles of Chatsworth, California has come up with.